I have been slacking in my pattern sharing, and it’s time to make up for it. Here is a sweet little hat for Valentine’s Day right around the corner, although in my opinion you don’t need official holidays to bust out the love! This hat is based off of Susan B. Anderson’s Sweetheart Hat. Hers is a knit hat with ombre cotton yarn. I loved the striped effect but 1) I don’t really like crocheting hats in cotton, since they’re not very stretchy, 2) I couldn’t even find the particular pinky yarn the last twenty times I visited Joanns in the U.S., and 3) even if you were to crochet the hat using stripey yarn, the amount of yarn used to crochet means that the hat looks like camouflage, not like nice stripes. Anyway, summary of story: here is a straightforward striped version. There are no fancy stitches, no tricky techniques. 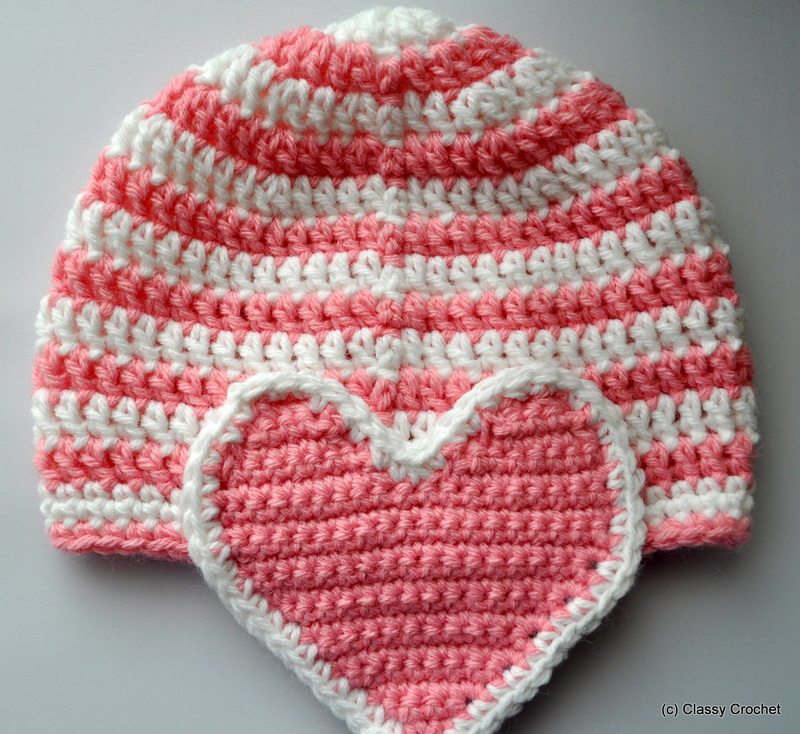 I used Lion Brand Pound of Love in these photos (pink and white) and a size H crochet hook. This specific post made me a hat for about a 9-12 month old, but your gauge and yarn may make you a smaller or larger hat. 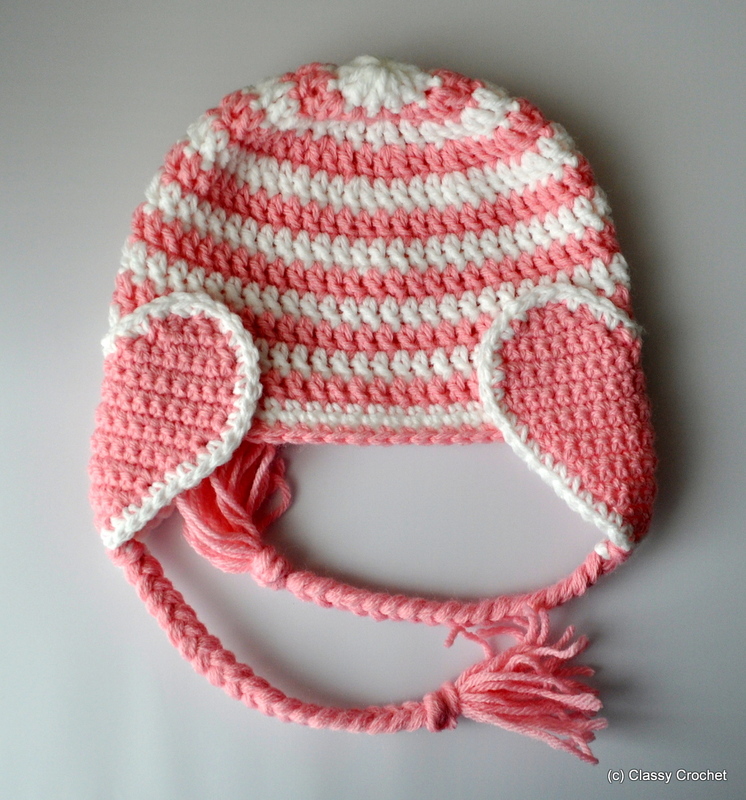 For more hat sizing options check out my free Striped Earflap Hat pattern. As always, feel free to adjust and improvise! Before you start, check out this post for tips on crocheting stripes in the round – it’ll save you a mound of headaches and keep your yarn nice and untangled. Row 1: Using white and H hook, ch4, sl st to form loop. Ch2, 12 dc into loop. Sl st to first ch2 (12 st). Row 2: Switch to pink. Ch2, dc in same st, 2 dc in each ch around, sl st to last st (24 st). Row 3: Switch back to white (you will be switching colors every round from here on out). Ch2, dc in same st, *1 dc in next st, 2 dc in next st* repeat from * around. Sl st to last st (36 st). Row 5: Ch2, dc in same st, *1 dc in next 4 st, 2 dc in next st* repeat from * around. 1 dc in each of last 4 st. Sl st to last st (54 st). Row 6-12: Ch2, dc in same st, 1 dc in each st all the way around. Sl st to last st.
Row 13-15: Ch1, sc in same st, 1 sc in each st all the way around, sl st to last st. You can switch colors one last time on the last row if desired. 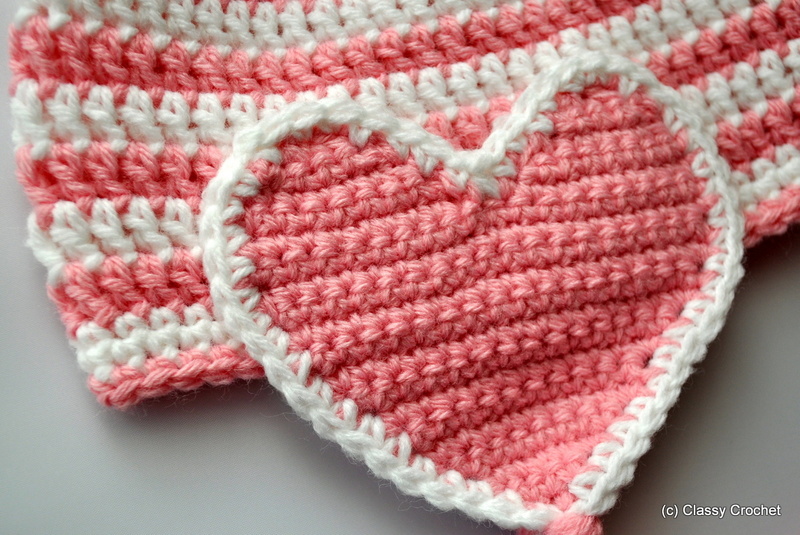 For the earflaps, I went straight to this amazing crochet heart pattern and whipped out two in pink (thank you, Bella Dia!). They end up being fairly large, so if you are making a smaller hat, I’d recommend ending the heart body at 15 stitches and finishing the hearts from there. The only other modification I made was switching to white when I sc around the edge. 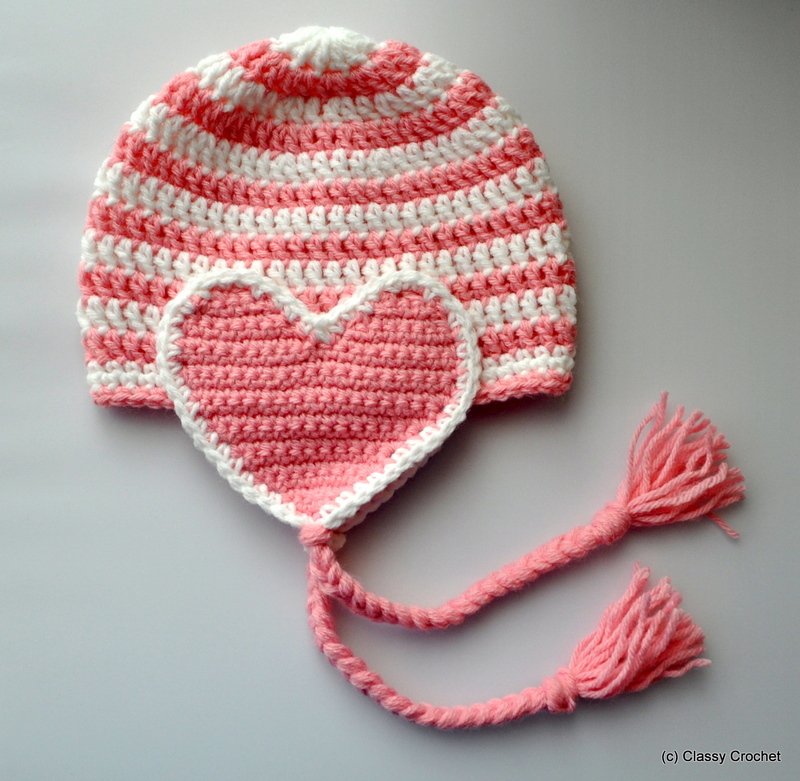 When you cut your last pink length, leave a long pink tail to sew the heart onto the hat. Weave in all the ends of the hat and two hearts. Using the long pink tail, sew each heart on either side of the hat. The hearts will seem kind of low on the hat, but remember, the bottoms need to cover the ears. I like to sew one of the hearts over the back seam – this way it won’t ever end up running right down the forehead if the hat is put on ‘backwards’. Attach two pink (or white, or pink and white, you choose, hooray!) braids to the bottoms of the hearts. I wrote up an earflap braid tutorial separately for future reference in case you want to add braids to ALL your future hats. Admire finished hat. Now go spread the love – follow along with the project gallery on Ravelry! I love this! My daughter is expecting twin girls in early November and I will make this in coordinating colors for them. I”m an experienced knitter but less so in crochet, so your detailed instructions and responses to questions are very helpful. Is there a gauge to try so I don’t waste time making it and find out it is too big or small?